The lightweight and breathable Web is versatile and stylish. Lightweight PU sole has patented built-in flex points that offer greater flexibility and vents for increased air flow. 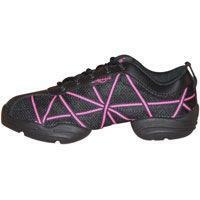 The breathable tech-mesh upper features contrasting colour tape in a flattering and artistic design. Please note the shoe may state a different UK size to the one you order as we find them much smaller and convert the size differently to the manufacturer. What shade of grey is it, ie dark = charcoal ranging to light = dove grey? The grey DS19s are a charcoal grey colour. These shoes would be good for Body Jam. Hope this helps.